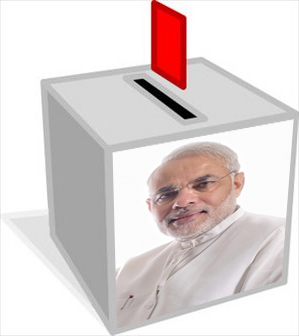 Khabar: Indian General Election 2014: The Choices Are: Ineptitude, Anarchy, and Communalism! Home > Magazine > Editorial > Indian General Election 2014: the Choices Are Ineptitude, Anarchy, and Communalism! 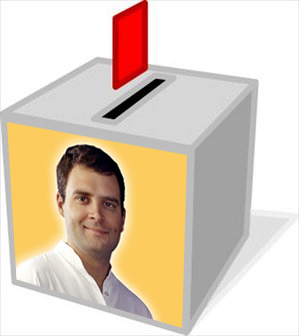 Indian General Election 2014: the Choices Are Ineptitude, Anarchy, and Communalism! (Left) Modi is the clear front-runner at the time of this writing. In terms of sheer scale and logistics, the Indian general election is a feat of staggering proportions. At close to three-quarters of a billion registered voters, this year’s Lok Sabha elections in April-May will be, by far, the most voluminous exercise of a democratic change in guard that the world has ever witnessed. What makes it truly awe-inspiring is that this massive transfer of power happens over an extremely diverse population of over 1.25 billion people. Not surprisingly, the event itself, without its colorful political parties and players factored in, generates quite the excitement in India, as well as amongst pundits around the world. This year, the grand saga is matched equally by the buzz of its key contenders—prime ministerial candidates who offer a striking contrast to the nondescript lame duck Manmohan Singh. There is the firebrand Narendra Modi (Bhartiya Janata Party), riding high on what his supporters describe as stellar economic growth in Gujarat, where he has been chief minister for over a decade. And then there is the rabble-rouser Arvind Kejriwal (Aam Aadmi Party), who captured the imagination of many in the nation with his principled and uncompromising bid to rid the nation of corruption. 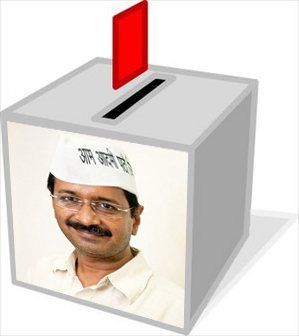 His sensational and short-lived run as CM of Delhi made him the talk of the town, earning him both critics and fans. Modi is the clear front-runner at the time of this writing. To an extent, it’s not surprising. In a country where corruption is endemic, here is a candidate who seems genuinely uninterested in amassing the kind of obscene wealth that his counterparts like Mayawati, Karunanidhi, Mulayam Singh Yadav, and Sharad Pawar, to name just a few, are notorious for. While his image as the architect of Gujarat’s vibrant growth has been debated, it would be hard to dispute that Modi has invested in infrastructure and polished the image of Gujarat as a business-friendly state. More significantly, he has been able to generate pride and optimism amongst Gujaratis—no small achievement considering that a good portion of the nation has grown pessimistic in recent years. Undoubtedly Modi’s image as a politician of conviction and capabilities is one that Rahul Gandhi (Indian National Congress, the incumbent party) flat-out can’t match. In fact Gandhi’s much-maligned interview in January with Arnab Goswami reminded me of the saying, “Better to remain silent and be thought a fool than to speak and to remove all doubt.” Unfortunately (for Gandhi) remaining silent is also an equally disastrous option for anyone contending for the top post in the country. Indeed Gandhi’s dogged dodging of the simplest questions does not inspire confidence at all. A prime ministerial candidate so afraid to come clean on key issues is not worth expending much ink on. Kejriwal started out with a lot of promise, and while, like Modi, he too seems incorruptible by the lure of money, many are now starting to feel unsure of his temperament. Here’s a man who is quite susceptible to making erratic and irrational decisions in his zeal and stubbornness—prime exhibit being his abrupt resignation from his chief minister post in just 49 days, simply because he was too impatient in transforming institutions that have been entrenched for decades. He has demonstrated that he does not have the ability or the temperament to build consensus, a core requirement for any leader anywhere, and certainly for someone who seeks to head the juggernaut of Indian governance. Prolifically labeling individuals, companies, parties, and the press as enemies is no way to govern in an environment that calls for coalition-building as a basic necessity. This self-proclaimed “anarchist” would like us to believe that his anarchy is only targeted towards the bad guys. But more often than not, his definition of the “bad guy” is anyone critical of him. Under the circumstances, Modi undoubtedly offers the best choice when it comes to governance. Then why are so many amongst India’s thought leaders, if not the masses, gravely worried about a Modi-led India? Those who are not ideologically, politically, or communally vested or blinded have legitimate reasons for concern, and that applies even to those who might vote for him on account of not having a better alternative. Notwithstanding Modi’s recent sound bites from the campaign trail about unity and brotherhood, and his admirable attempts at tamping down his communal instincts, the fact is that Modi at his core is a Hindutva ideologue. Here’s a man who is an affirmed trooper of the Rashtriya Swayamsevak Sangh (RSS), a right-wing, paramilitary, Hindu nationalist group. In that light, the vigorous attempts of his camp to absolve him of his role and responsibility as the chief minister presiding over the worst communal riots in the history of Gujarat are unconvincing. They cite that the Supreme Court of India has cleared him of wrongdoing. But the fact that a crime was not provable in the court of law does not always mean it did not happen (there were allegations of widespread fear-mongering, threats, and lack of witness protection that had influenced the outcome.). The only thing that the Supreme Court clearance means is that Modi cannot be held legally liable. But the court of law and the court of public opinion are two different matters. In fact, scrutiny in the court of public opinion becomes far more necessary in the case of public officials. And certainly when that person is running for the position of prime minister! The nation cannot afford not to apply the highest level of scrutiny and debate, and more so when the allegations were nothing less than a pogrom against a minority community. Hindus cannot afford to take comfort in their majority. It is a matter of national integrity. No nation can function smoothly, let alone prosper, in an environment of communalism. I end with the sad realization that each of the candidates comes with seemingly insurmountable deficiencies. The Indian voter is faced with the painfully unenviable task of deciding which will be the least of evils: ineptitude, anarchy, or communalism.